The Baale of Oshoroko Village in Ibeju-Lekki area of Lagos State, Chief Olusegun Oyeri, alongside three others have been arrested by the Lagos State police command for allegedly masterminding the death of an inspector and hiding his body for nine months. Inspector Musa Sunday of the Special Anti Robbery Squad (SARS) had disappeared mysteriously while responding to a distress call in the area, but his body was yesterday found at the Ibeju-Lekki waterfront. Several months of police undercover investigations paid-off recently after an informant revealed that the community members swore to an oath of secrecy. After the tip-off, the informant took the police team to the waterfront where they dug up his decomposed body and his service rifle, an AK47. When the body was found, the police immediately swung into action and arrested the Baale, alongside three others who were identified as Aroki Badiru, Nasiru Isiaka and Akeem Balogun. Confirming the incident, the state police boss, Fatai Owoseni, said the deceased was declared missing on November 29, 2016. 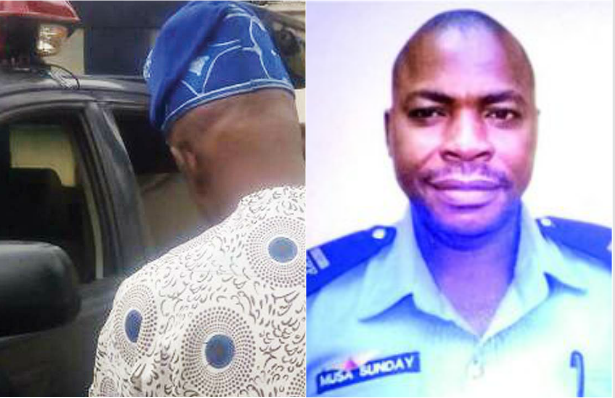 “Inspector Musa Sunday disappeared from a crime scene in Ibeju-Lekki when he was, alongside other officers, deployed to that axis from Ibeju-Lekki Free Trade Zone. In the course of patrol, they were alerted by the community of a communal fight between two families over land issues. “Dutifully, they joined the informant but on getting there, one of the community callously turned against the patrol team and at the end of the fight, the team returned without Sunday. “The next day, I went there and met the traditional rulers and elders of the community to appeal to them to release the inspector if they have him in their custody. They denied seeing him. “We put together a team of policemen with technical support from the Inspector General of Police Intelligence Response Team (IRT) led by DSP Philips and they sustained investigations. Based on intelligence, nine months later, his decomposed body was found buried along the waterway with his service AK47. “We swung into action and arrested the Baale of the community and three others. The law does not respect anyone and we use this to send a message to criminals pretending to be custodians of our culture. The Baale, when interrogated, denied involvement of the killing, adding that he had fingered the chief of the community but the police turned a deaf ear. In another development, the police yesterday arrested five persons over acts of jungle justice after they lynched a yet-to-be identified man at Oshodi on Tuesday. According to Guardian, the arrested persons are Ogbonna Nwankwo, Oyetunji Abimbola, Akeem Jimoh, Kingsley Okoro and Idris Adebisi.They were arrested for instigating the mob that lynched the deceased over allegations that he kidnapped two children at Akinpelu area of Oshodi. By the time the Akinpelu Police Division got to the scene, the deceased was already clubbed to death, leaving his corpse for the police to take to the morgue. Confirming the incident, Owoseni said despite warnings to members of the public to desist from taking the law into their hands, these suspects enacted same act. 0 Response to "Police arrest Lagos Baale, three others for killing, hiding body of policeman for 9-months"